The Winter CSA Shares consist of 6 pick-ups of organic vegetables over a 12 week period from November 7th 2018 to January 24th 2019. Pick-ups are on alternate Wednesdays at the farm or Thursdays at off-site locations. 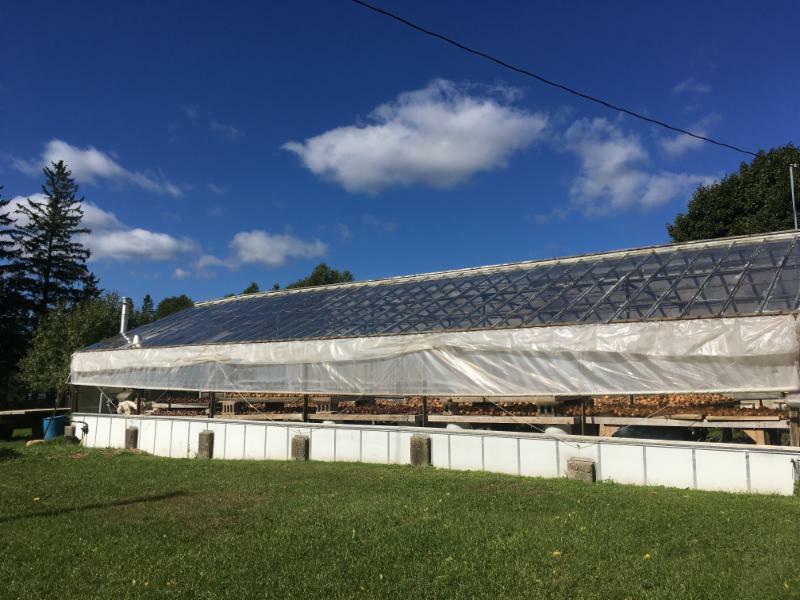 Each pick-up includes an assortment of delicious storage crops (potatoes, beets, squash, carrots, onions, garlic, and more) and fresh greens harvested straight from our fields and hoop house. Order your share through the online store or come by the Farm Workshop to place your order! 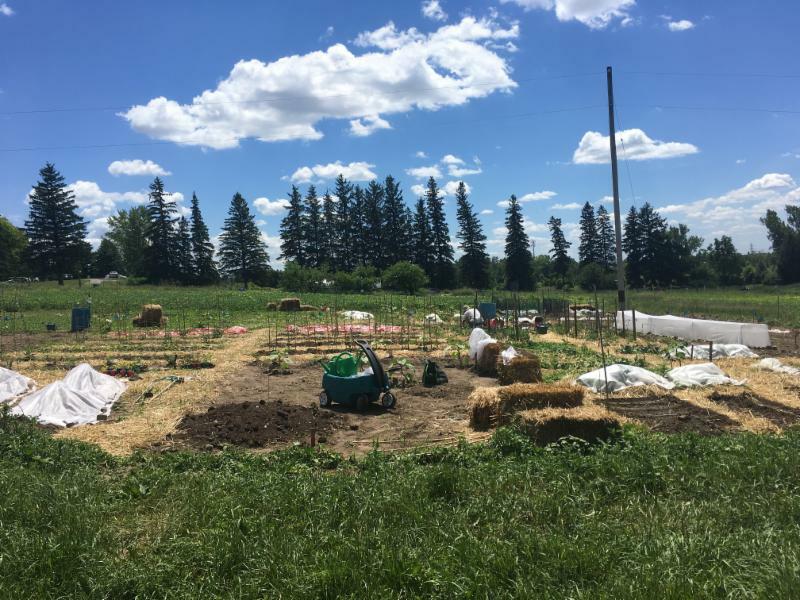 Registration for 2019 CSA Shares are Community Garden Plots are now open in the online farm store. If online shopping isn't your thing - no worries! Just come into the farm workshop and we'll have registration forms ready for you. 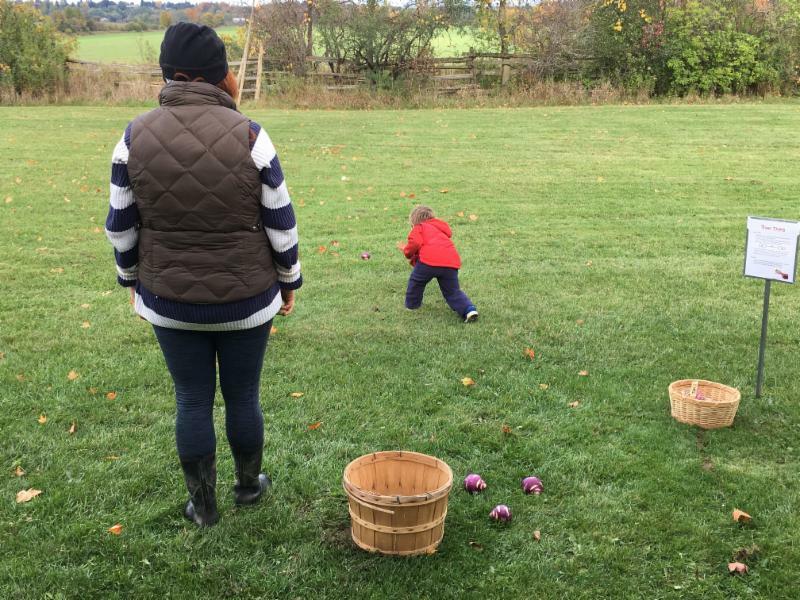 Come Clean and Glean with Us! On Oct 23rd, come help clean up the stakes and twine from the community garden fields and glean any remaining produce from the gardens! If you are interested in this opportunity, reach out to Amy at farmeducation@ignatiusguelph.ca / 519-824-1250 ext 244. We break for lunch between 12:30-2pm. Please bring a brown bagged lunch or a potluck dish to share. Reminder to community gardeners: Clean any tools, stones and other materials from your plots by October 22nd. Thank you! 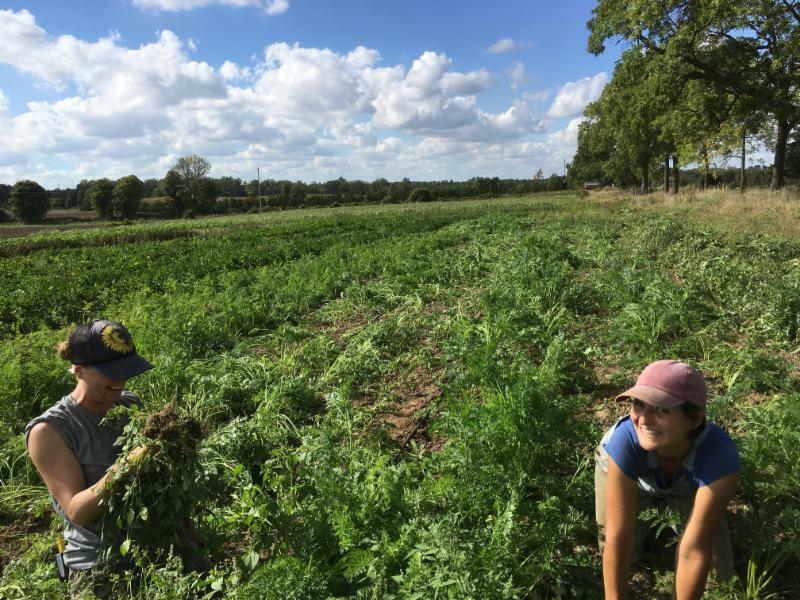 Becky (left) and Lindsay (right) weeding carrots that will soon be filling your winter CSA boxes. What's your favourite way to prepare carrots? Share your recipes with us at farmeducation@ignatiusguelph.ca and they could end up featured in the next newsletter! 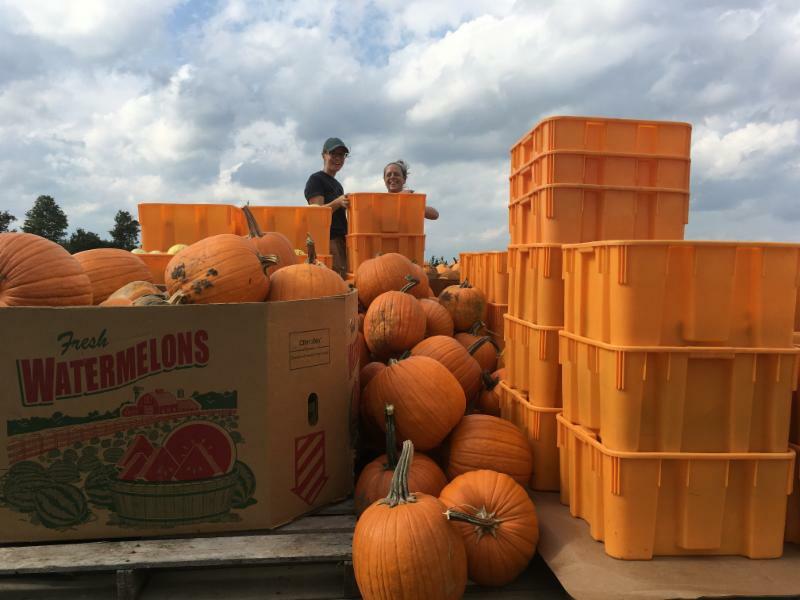 The epic winter squash harvest of 2018 was completed in one afternoon with the help of many hands! 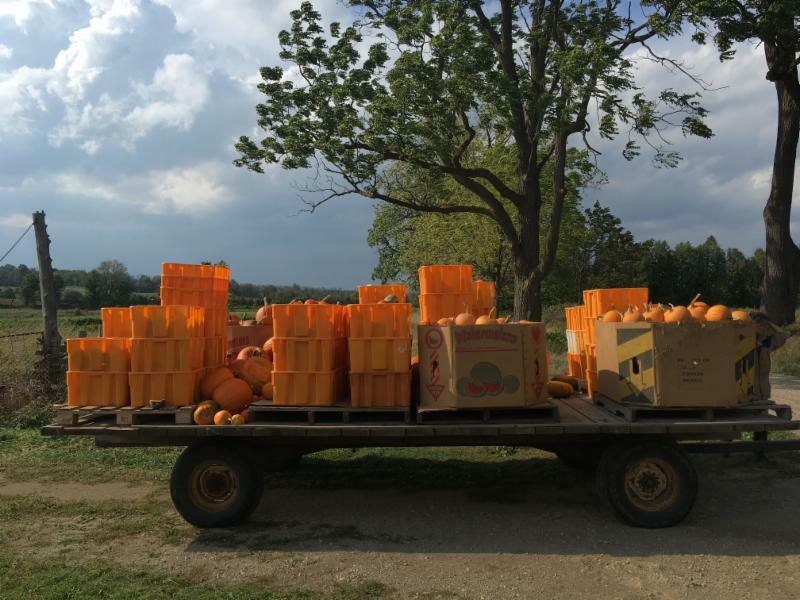 The harvest filled this entire trailer with beautiful vegetables including pumpkins, butternut, and acorn squash. It's certainly starting to look and feel like fall at the farm. 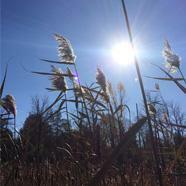 The Old-Growth Forest project is hosting a phragmites workshop October 20th, 10am-3pm. Join Martin Tamlyn (OGF project) and Lynn Short (professor of Horticulture at Humber College) as they examine current ecological & community-based approaches to phragmites control. We will take an in-depth look at the biology and behaviours of this invasive plant to better inform our strategies for eradication. At lunch there will be lots of opportunity to share your own project's success and challenges. Cost is $25 each and registration is required. 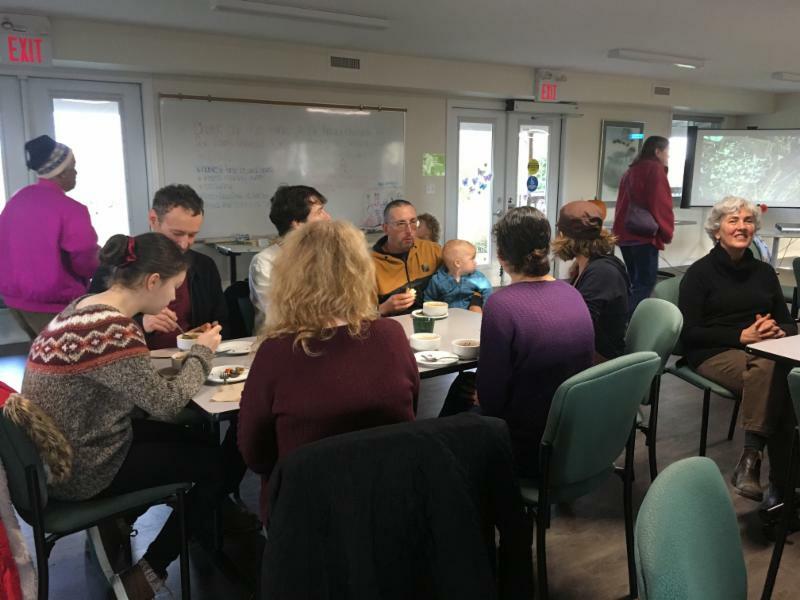 Contact Martin Tamlyn at 519-824-1250 ext 224 or email oldgrowthforest@ignatiusguelph.ca . 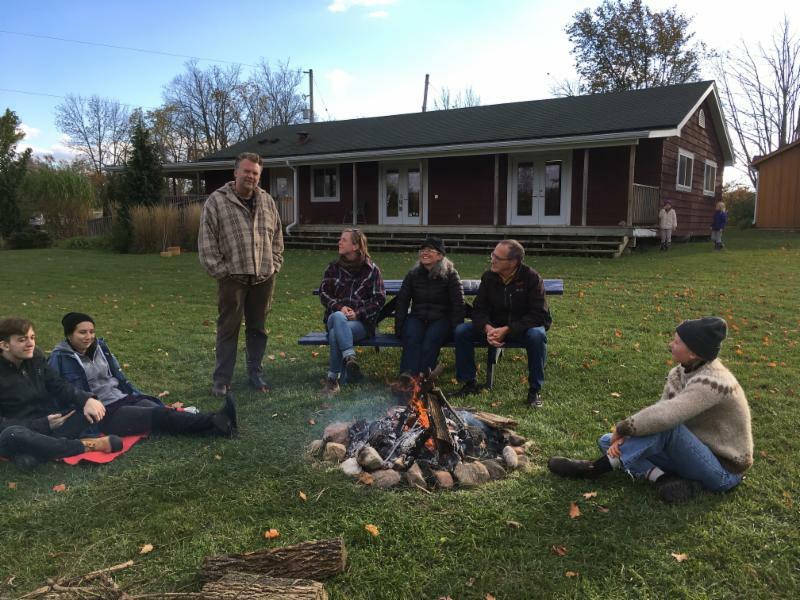 The Ignatius Farm community came together this past weekend to celebrate the harvest season and each other with a shared stone soup meal. 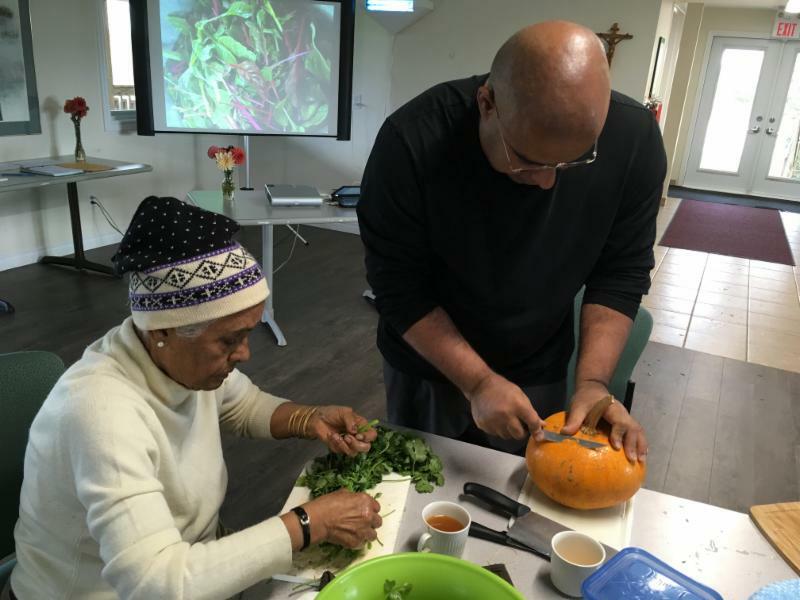 We took a few moments to celebrate the gardeners and CSA members who have been with the farm for 15 (or more!) years. Extra special shout-out to Karen Maitland who has been tending to crops on this land for 30 years, and Julie and Bill Flaherty who have been part of the CSA since its inception in 2001! Your deep knowledge of this land and commitment to this farm enables us to thrive together. The farm team extends a HUGE thank you to everyone who placed votes for Ignatius Farm in the Aviva Community Fund Competition! We received over 4,200 votes and are so appreciative and overjoyed with the support from farm members and the wider Guelph community. The winners of the competition will be announced on November 20th. Stay tuned to the newsletters and Facebook group for updates! To help us continue to get to know you and heighten your experience with the farm, we would love to invite you to participate in a short 4-min survey. The survey is part of one of our intern's, Sheri's, independent project. 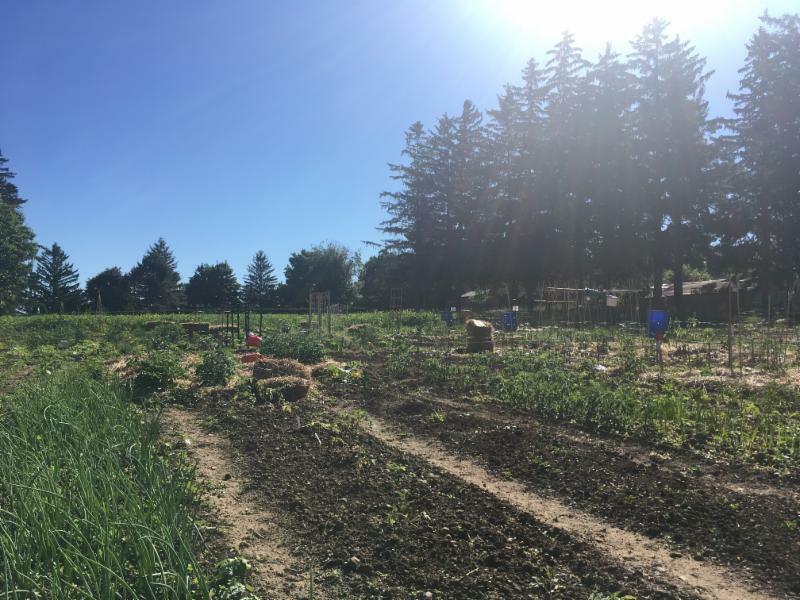 Sheri is looking into how and why Ignatius Farm members choose to eat/grow organic food. This information will help us to better understand your eating preferences and to grow/offer food that you want available! The survey will close this Friday, October 19th. Thank you very much for your participation! The farm has been blessed with an abundance of sweet peppers this year. 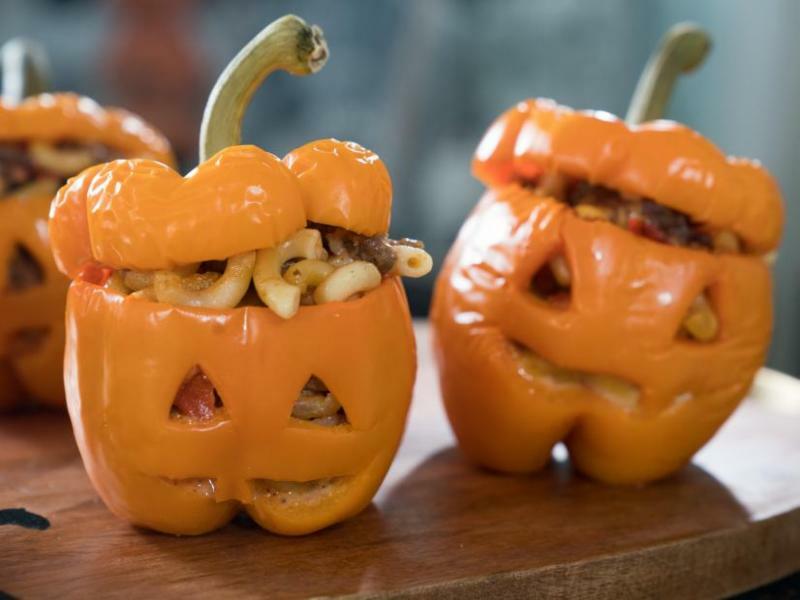 Try a fun halloween-themed spin on stuffed peppers with this great recipe! Bring a small pot of salted water to a boil. Cook the pasta to al dente according to the package instructions. Drain and hold until the meat mixture is ready.